Sometimes bigger is better and the generous scale of the Marden Corner Sofa Set should not be underestimated. 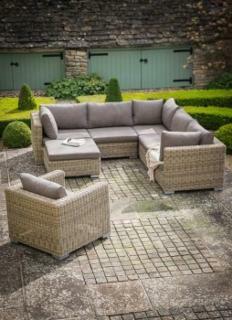 A truly stunning piece of garden furniture large enough to fit the whole family. The sofa is modular and comprises 3x Corner sections and 2x Central sections and can be fitted in an 'L' shape either left or right. The set also includes an Armchair and the Ottoman can be used as a chaise lounge extension, coffee table or stool.